Olive Oil Neutralizing Shampoo contains rich concentrated ingredients that remove excess alkali and caustic residue after hair has been relaxed. Adjusts hair to its normal pH balance. The built in color alarm lets you know if caustic residue has been removed from hair. Restores pH balance - pH 5.5. 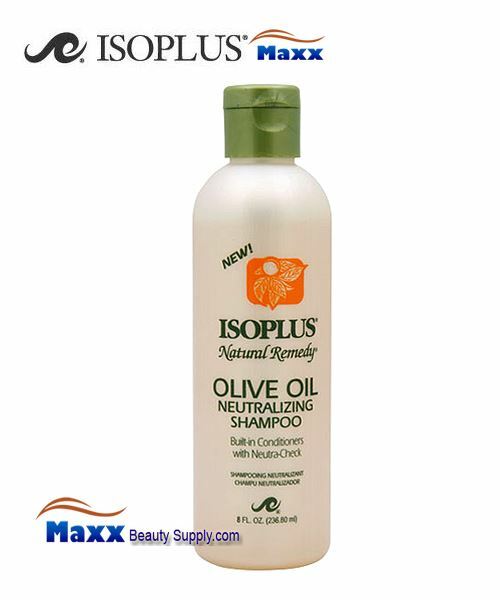 Isoplus Natural Remedy Olive Oil Neutralizing Shampoo Built-in Conditioners with Neutra-Check. Thoroughly rinse relaxer from hair. Apply Isoplus Natural Remedy Neutralizing Shampoo to hair, work into lather and rinse. Repeat. Isoplus Natural Remedy Neutralizing Shampoo color alarm leave a pinkish color if all caustic residue is not removed from the hair and scalp.